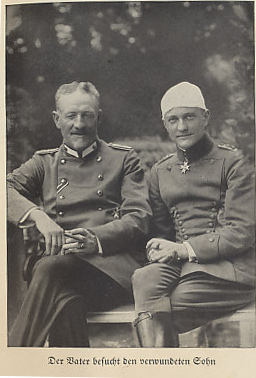 Cavalry commander Manfred von Richthofen visits his wounded son, the more famous Manfred von Richthofen, wounded by gunner second Lieutenant A.E. Woodbridge on July 6, 1917 in a fight with an FE2b of 20 Squadron. Der Vater besucht den verwundeten Sohn. The father visits the wounded son. "The day began well. We had scarcely gone to an altitude of 6,000 feet when an English patrol of five machines was coming our way. We attacked them by a rush as if we were cavalry, and the hostile squadron lay destroyed on the ground. None of our men was even wounded. 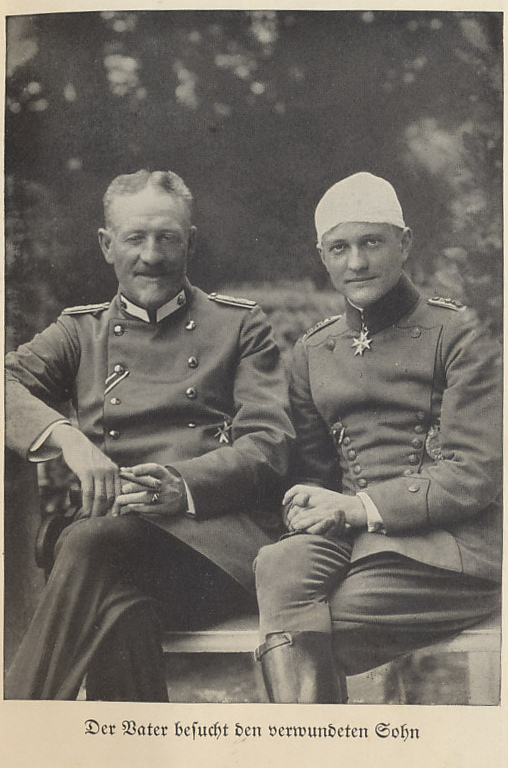 Of our enemies three had plunged to the ground, and two had come down in flames. . . .
Boelcke's Squadron had only once been able to make a similar report. At that time we had shot down eight machines. To-day one of us had brought low four of his opponents. The hero was a Lieutenant Wolff, a delicate-looking little fellow, in whom nobody could have suspected a redoubtable hero. My brother had destroyed two, Schäfer two, Festner two, and I three." Three paragraphs from the chapter 'My Record Day', April 13, 1917, by Manfred von Richthofen. The baron was then flying an all-red Albatros D.III. His victims were two-seater planes, an R.E.8 and two F.E.2b, four of the six men killed and two wounded. Von Richthofen was flying over the battlefield of Britain's Arras Offensive. The British losses were so heavy the month was called 'Bloody April': 245 aircraft and balloons lost and 316 airmen killed or missing. The Germans reported 76 planes and seven balloons lost. Oswald Boelcke had been Germany's leading ace with 40 victories when he died on October 28, 1916. Von Richthofen's victories were numbers 41, 42, and 43.